I feel a bit like Bill Murray’s character in Groundhog Day at the moment – reliving an experience over and over until I’m finally able to reflect and learn some lesson. 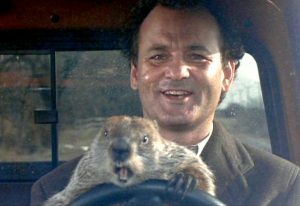 But instead of watching Punxsutawney Phil emerge from his hole, I just keep getting sick – over and over again! In my quest to figure out the lesson, I’ve been thinking about ‘me’ and ‘my body’ and the connection (or lack thereof). I tend to think of my body as something that serves me – or that can fail me and let me down, and that something that is somehow separate from ‘me’. I don’t think that this is particularly uncommon. Just the way that we talk about someone’s relationship with their body implies some kind of distinction between the two. By definition, a ‘relationship’ requires a connection between two or more things. I’m not quite sure where this thinking will lead and I haven’t tied the ends together to make a neat and coherent answer, but I do wonder if I could be healthier and happier if I was able to integrate my body and physical health more with my sense of self. Related to the above thinking about my physical health, I’ve also found myself asking ‘why?’. People who have worked with me will know that I’m always trying to analyse failures and improve systems/processes, so I’ve naturally being asking ‘what went wrong?, what could I have done to avoid this?’. It’s impossible to know for sure, but one of the possible answers I’ve come up with is sugar. In my subsequent Googling I came across this piece which reveals that glucose can dramatically impact the type of inflammation that different infections cause. The increased light was making the algae grow faster, but they ended up containing fewer of the nutrients the zooplankton needed to thrive. By speeding up their growth, the researchers had essentially turned the algae into junk food. The zooplankton had plenty to eat, but their food was less nutritious, and so they were starving. This is a long but fascinating (if rather depressing) read on the impact that increased carbon dioxide levels in the atmosphere are having on plants and the potential implications of this for human health. It also makes me wonder how we can get more smart people to solve problems that matter. Teenage girls now live in a world where reality is warped by Instagram filters and Photoshop, where friends look like models and models feel like friends. They exist in a society that values ‘likes’ and ‘comments’, ‘follows’ and ‘shares’, one where beauty is defined by brands that profit from your insecurity. So what does all this have to do with hiking? Everything. Because hiking can dismantle it all. Although E is only 4 I already feel a little anxious about how best to support her through the social/emotional challenges of being a teenager! In recent years I’ve been noticing more and more just how beneficial walking in nature is for my own mental health, and I’ve loved beginning to share the joy of bushwalking with her (the 800m Koala Path at Tidbinbilla is one of her favourites and manageable for little legs without too much complaint!). This piece makes me feel excited and optimistic about continuing to build on our little nature strolls.